Have you picked your jaw up off the ground yet? You know what hit the fan on Gang Related Season 1 Episode 12 and it wasn't pretty. Where to even start? It's crazy how much stuff went down in one episode. With secret alliances and unexpected manipulations, just about anything could happen next. Jessica found out about Ryan's secret relationship with the Acostas, but she didn't immediately turn him in. She justified keeping his betrayal a secret as being for the greater good. If he was arrested, she feared his cases would be overturned and the Gang Task Force shut down. She was probably right, but does that mean she should let him stay out on the streets and in his job? Probably not. Ryan really is a good guy who made some poor decisions, so he didn't run off or act against her. In fact, he helped get Acosta to turn against the Metas and was willing to continue helping DA's office bring down gangs. When he was forced to face the reality of what he had done, he chose to not only save himself, but to work for justice. Yes, Ryan helped the Acosta get away with breaking the law, but did he do anything that was worse than some of Chapel's actions? I'm not sure. Chapel's deal with the Lords to attack Acosta was pretty shady. While the plan wasn't to kill Acosta, one puncture wound in the wrong location and it could have turned deadly. At this point, I'm not really sure what Acosta is planning. He has so many different deals and alliances in play, it's unclear what he's trying to do. He needs to take out the Metas and the Gang Task Force helped weaken them. And, the new partnership between the Los Angelicos and the Lords will give them strength in numbers against the Metas too. He expects to be in prison for 30 years, but also believes that the Los Angelicos can remain strong while he's behind bars. What happened to getting his family out of the criminal life? Is that dream over now? The biggest shocker was that Acosta has a mole even bigger than Ryan. He's been working with DA Ellis. What? I didn't see that coming and that's a bit of a problem. That bombshell wasn't earned. Maybe I missed it, but there was never an indication that Acosta had another high placed mole. I can't remember an instance when Acosta knew something was coming and didn't hear it from Ryan. Wouldn't she have been able to warn Acosta of Daniel's arrest? Both the Metas and Acosta/Ellis discussed taking care of Jessica, but which of them actually followed through with taking out the ADA? My guess is that it wasn't the Metas. If they wanted Chapel to lay off them, they wouldn't have actually killed Jessica because that took their leverage away. Unless they assumed she was just one person that could be used against him. They would have better off attacking her and leaving her alive to threaten her life. Acosta and Ellis needed her dead so she wouldn't interfere with their plan with Ryan's deal. Ellis can just pretend she hadn't heard from Jessica yet and let Ryan believe his secret is safe. Of course, that's not going to work since Carter got Jessica's voice mail message about Ryan. And, the duffle bag is in her storage unit. There's certainly some record of that to be tracked down. There are a lot of open storylines left for with only one episode left. 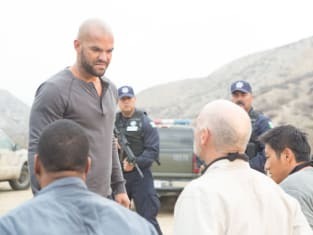 In the season finale, Chapel will be out for revenge for Jessica's death and he hasn't held back in the past, so it will be no holds barred going forward. The Metas, Los Angelicos and Lords relationship remains to be played out. Plus, there are a few smaller storylines that haven't entirely played out. Vee's HIV status is still unknown and Tae Kim's past is hanging over him and now Vee saw him steal money from the Metas' money house. Those issues could remain to be resolved in a potential season 2, but since the series hasn't been renewed yet I'm doubtful it will be. If "Alamdena" is any indication, next week's finale will be even more insane and action packed!